There are others too that will do the trick for you. I simply installed a three stage battery charger from Napa in mine. It's tapped into the house 110V breakers so, I can turn it off if need be. But, first, confirm your model RV was NOT supplied with chassis battery charging from the factory. That is, is your inverter/charger set up to charge both house batteries and chassis batteries? Make sure you don't have , or do have, a "converter" that will keep the chassis batteries charged. As for " where your inverter/charger is on your particular coach, not sure. In our '04 Itasca Horizon D/P 36' with a 330 CAT, it's in the compartment just behind the left rear set of duals. It's called the "Dimensions 2000 Watt Inverter/Charger". Go to Wiring Diagrams. There you will see diagrams for 2004 Suncruiser models listed. Pick your model. You can easily add a converter. Make sure it is a 3-stage. But, unless you are competent in matters electrical, take it to a qualified shop. Im having the problem with the house batteries not charging on shoreline power. The coach battery is supposed to be charged while connected to shore power from your 45 amp converter charger located under your stove. Battery Disconnect switch must be ON for converter to charge the coach battery when connected to shore power. Make sure the Fridge/Conv AC breaker is ON. That 15 amp AC breaker feeds the Relay 2 BRKR pin on the ESM board mounted in your AC distribution panel. There is a jumper wire from that pin to the Line 2 pin on the board. The cable going to the converter recepticle (under stove) also connects to the Line 2 pin. Converter plugs into the recepticle under stove. Not sure what converter model you have (mounted under stove), but there may be fuses on it that you would need to check. Most likely there should be some form of a false panel under the stove. Output from converter goes to an isolated stud somewhere close to the converter. One lead from that goes to your DC distribution panel (door entry well). The other lead from the stud goes back to a covered panel that is labled Automotive and Coach Circuit Breakers (Battery Mode Solinoid and Relays). The wire from the converter stud goes to the 55 amp breaker in that box. That breaker is feed by the Battery disconnect switch. Battery Disconnect switch must be ON for converter to charge the coach battery when connected to shore power. You need to check all those breakers and possible fuses in the path from converter to battery. Sounds like pretty good techincal advice. Way over and above what I'm offering. I don't know that level or model of coach so, I hope he helps you out some. Based on your last messages/answers, you now have no charge to any batteries at all correct? Dave, thank you so much for all the info, very detailed.I will be able to let you know about 10 days on what I find. I'm new to RV'S. I have pretty good automotive skills but when is comes to RV'S I'm lost. Thank you Scott, dave and everyone else. The RV is a Itasca Suncruiser 33 foot, 2 slides, 8.1 Liter. Dave, With the engine running, does the alternator charge the chassis and coach. Or just the chassis battery. Far as I could see, just the chassis battery. A device like a B.I.R.D controller is needed that energizes the Aux Start Relay (Battery Boost) in the Chassis Electrical box in order to do that. A B.I.R.D is Bi-direction meaning if alternator is running it will also charge the Coach battery AND if Coach Converter/Charger (or Inverter/Charger) is running on Shore Power/Generator it will allow charging of the Chassis Battery. The addon Trickle-L-Charger only allows charging of Chassis Battery by Coach Converter/Charger (or Inverter/Charger) when on Shore Power/Generator . Many Winnebago owners have added these because of the parasitic draws present in the chassis electrical system. A dead chassis battery is no fun (not to mention can be expensive). Either one of those can be added if you so desire. Additionally, Solar Charger would act like converter so it to could potentially chage chassis battery. Some rigs are wired to allow Solar to charge chassis from the factory. BatteryTender/BatteryMonitor is an add-on AC charger that can either be connected to the chassis or coach battery system. Normally connected to chassis battery. Battery maintaining in storage tends be a rather lively subject with many ways to skin the cat. [QUOTE=04suncruiser;1004716]Dave, thank you so much for all the info, very detailed.I will be able to let you know about 10 days on what I find. I'm new to RV'S. I have pretty good automotive skills but when is comes to RV'S I'm lost. Thank you Scott, dave and everyone else. The RV is a Itasca Suncruiser 33 foot, 2 slides, 8.1 Liter. The alternator should charge both the coach and chassis batteries. The easiest way to tell if it does is to start the engine then go back to the "Oneplace" panel and check the battery condition. Both the house and chassis batteries should read a maximum of about 14.4 volts when the alternator is charging. If the house batteries aren't showing a charge when the engine is running the transfer solenoid is probably burnt out. It's behind a panel under the entry stairs and looks like a Ford starter solenoid. If it needs to be replaced get one from an RV dealer not an auto parts house. This solenoid has a 100% duty cycle, meaning it is energized anytime the engine is running. The similar looking Ford starter solenoid does not have a 100% duty cycle. It will overheat and burn out in a few minutes time. Other than your batteries not charging from shore power does all your appliances and 120 volt equipment work otherwise? Do your batteries charge from your generator? I've had mine on shore line for a couple of months and the house batt went dead. I hear a humming noise under the fridge. Its not noticeable unless its very quite outside. What is making this noise? This is my first MH and still learning. This is the longest that I've had it on shore line. Does that have anything to do with the dead batt? I did notice that there was a lot of corrosion build up on the Postive cable at the post. It ate up the bolt. I put a new bolt and my helper didn't tighten the cable to the post and it started corrision problem again. A. Could the loose connection have anything to do with the corrsion building up? B. Could the loose connection have anything to do with the battery going dead. Its never gone dead before. Both house and chassis batteries are charged by the alternator. There is a continuous duty solenoid/relay that is activated by a lead connected to the "Run" terminal on the ignition switch. That connects the chassis and house batteries together. The solenoid is also activated by the "AUX START" switch on the dash. That allows the house batteries to help start the engine if the chassis battery is low. This is the diagram showing how the AUX solenoid and battery disconnect solenoid is wired. 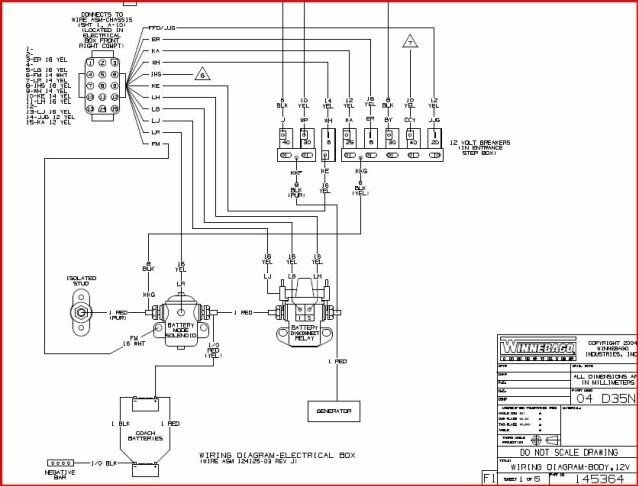 What I could not derive from the drawings without having the chassis wiring diagram, is your statement "activated by a lead connected to the "Run" terminal on the ignition switch". That is why I said "Far as I could see, just the chassis battery." I knew everything else and could trace the wiring back to applicable device. Personally, I feel having the AUX relay connected directly to the "RUN" terminal is a bad idea. If alternator fails, you will drain down both chassis and coach batteries. A typical B.I.R.D type system will not connect the 2 banks if the Alternator is not charging unless you use the AUX start switch. A B.I.R.D type system will only energize the relay if it senses a charging voltage is present.